Somewhere in Japan there exists a house where, every so often, a yokai (or spirit) in the shape of foot appears and demands to be cleaned. If it is cleaned, it leaves peacefully. If it is not cleaned, it becomes angry and smashes things until it is satisfied. This is our very dumb take on that story. You have three minutes to clean the foot. Tools are scattered around the house to help you. Good luck! This game prototype is 100% free, but your donations encourage us to work on new game projects and help us buy food. Thanks! Follow Two Glass Hams on Twitter and Facebook! Ashi Wash - what's new? New version of Ashi Wash coming soon! We'd like to, but unfortunately we currently don't have easy access to a Mac that supports our version of UE4 (our game engine). Hopefully in the future! Okay, let me know if you do. Loved it! So simple yet so much fun! Had a blast playing it! Keep on rocking! This fit in perfectly for the 2nd game in my video i hope you enjoy :D.
A very strange game, but not bad. The art is simple but nice. the only real problem is that it's short. great job. After conducting our market research, we noticed a distinct lack of games featuring giant feet as major characters as well games emphasizing the importance of hygiene. This is the #content that many different demographics wish they had access to but simply don't. We're excited to meet consumer demands and "make the world a better place, one product at a time." Thanks, we can't wait to release it, either! This was a nice little breather from all the serious games that I've been playing recently. I LOVED the voice acting. It was perfect. It had me *trying* to speak in that accent the entire time I was playing! The mechanics were simplistic, but not too easy. I like how the 'nasty' on the foot was randomly generated differently each time the game was loaded. The game lagged a tiny bit in the first few minutes of playing it, but it got really smooth after a bit. So it may have just been my pc + unreal (they don't play well together). The music was perfect and really inspired me to rush. That's always good in a game that only gives you three minutes. I have no complaints! This is the ideal arcade-esque experience that I look for in indie games. If you are still working on this, I can't wait to see it grow into something more! Thanks for making it! Probably the strangest game I've ever played -- but it was still fun for what it was. Looking forward to future dev. Gross foot but, good game. I failed both times I tried to clean him. I think on the second attempt I almost won but, that stubborn callous thing got me in the end! I played Ashi Wash in my Three Random Games video! But oh boy this one takes the cake! I wish there were more levels to play and different types of foot maintenance to preform on the giant foot! But great job on this game, and keep it up! That will take you to the download page itself, from there click the red download button next to "Ashi Wash 0.5 Windows (LATEST)" if you want to play the most recent build that we uploaded back in August of 2016, or the button next to "Ashi Wash Prototype Windows (OLD)" if you want to play the older, uglier version that Markiplier played. The game was pretty fun, Just a little short. I clean and i ship them! All the feet! Ashi Wash was a weird, yet fun game! I really enjoyed it! It doesn't have much to it but that's okay. It is weird on it's own! I really wish the game was longer, just like what the guy said below. Maybe including the other foot, or two feet at once. Increasing the difficulty as you progress into the game. All in all, it's good! Ashi Wash has got to be one of the grossest games that I ever played and I mean that in a good way! 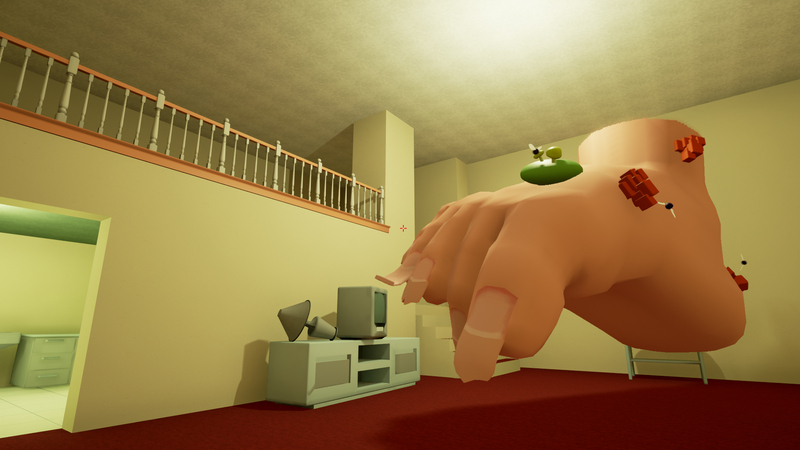 The premise of the game is that you have to clean a disgusting foot that somehow appears in your house before the time runs out. The environment and graphics look surprisingly nice for an indie game, and the controls all function pretty well. All the mechanics work as they should and even the music is spot-on for a ridiculous game like this. The foot's voice acting made me crack up a few times and it genuinely grossed me out to the point where I thought I would be sick! I do wish the game was longer or that there were more levels to complete so it would add some replayability. And for some reason killing the flies with the fly swatter feels hit or miss as it's pretty difficult to kill them in one swing. All in all though, Ashi Wash is a ridiculously fun and weird game that everyone should play and I hope the developer is continuing to add more to the game. I made a Let's Play of Ashi Wash so I hope you check it out and let me know what you think! How do you grab stuff??? This was possibly the weirdest game I have ever played and I sort of love it! This music is stuck in my head too and I bet it'll be stuck in yours! Thanks for the feedback! Without saying too much we've actually discussed some sort of randomness in the gameplay, and we're currently working on a build for an event in which we'd like to at least have random tool placements, but we've got limited time to work on the new build and we'd have to completely redesign some stuff around that. Can we get the soundtrack, please? If music could be food this game's main theme and little jingles would be parmesan cheese. Awesome to hear you guys are actually developing this actively. Also, seeing a lot of people have linked their videos with good response I'm accidentally on purpose dropping mine too. It is in Spanish, tho. Yep, just click "Download Now" and then "No thanks, just take me to the downloads"
When you click the "Download Now" button, it will give you the option to either just download the game for free by clicking "No thanks, just take me to the downloads" OR pay us however much you feel like paying us for the game, if you feel like giving us money. The "free" option isn't immediately noticeable (I've circled it here to make it a bit easier to see), but I'm not sure if we can change that. This game is 100% free, but there is an option to pay us if you feel like giving us money. To download the game for free click "Download Now" and then "No thanks, just take me to the downloads". How do I play any games on this?! This game is only for Windows-based PCs, and even then we can only confirm that it works on Windows 7, 8/8.1, and 10. To download the game for free, click "Download Now" and then the page will ask if you would like to pay for the game - simply click "No thanks, just take me to the downloads" and you can download it from there.